Relevance Rock1:ER-KD Plasmid contains a kinase-dead human ROCK I (2–537) in which Lys105 is mutated to glycine. 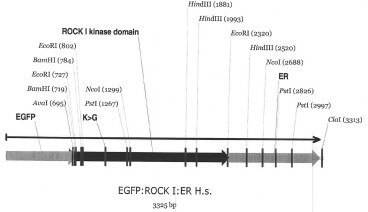 ROCK I KD is fused to the hormone-binding domain of the estrogen receptor. 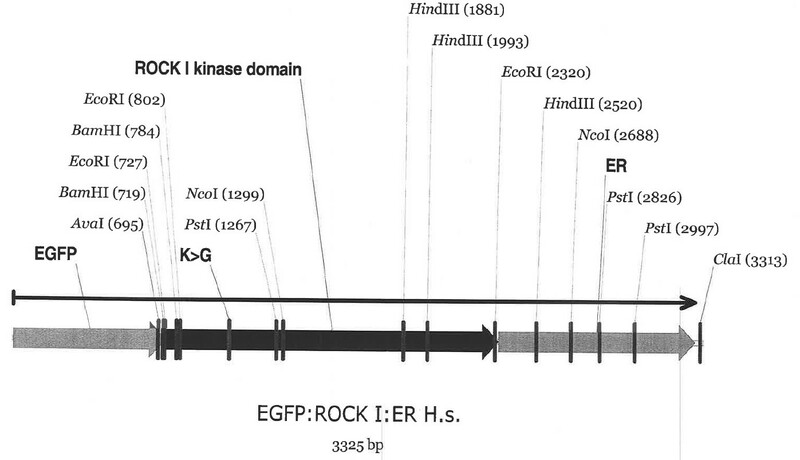 Rock1:ER-KD is the control for Rock1:ER (catalogue code 152721). The KD mutant was applied in Croft et al., 2005.The protein is fused to eGFP for visualisation. Ultimately, Rock1 activation leads to phosphorylation of proteins involved in the regulation of the actin‐myosin cytoskeleton, generation of pronounced actin stress fibers, and changes in cell morphology. Rock1:ER GFP serves as a good complement for small‐molecule Rock1 inhibitors. Croft et al. 2005. J Cell Biol. 168(2):245-55. PMID: 15657395. Actin-myosin-based contraction is responsible for apoptotic nuclear disintegration.